At last, here are more love letters from Vlado. In 1951, he was just 31, so he was having a good time, dating lots of girls, and not interested in settling down to marriage. 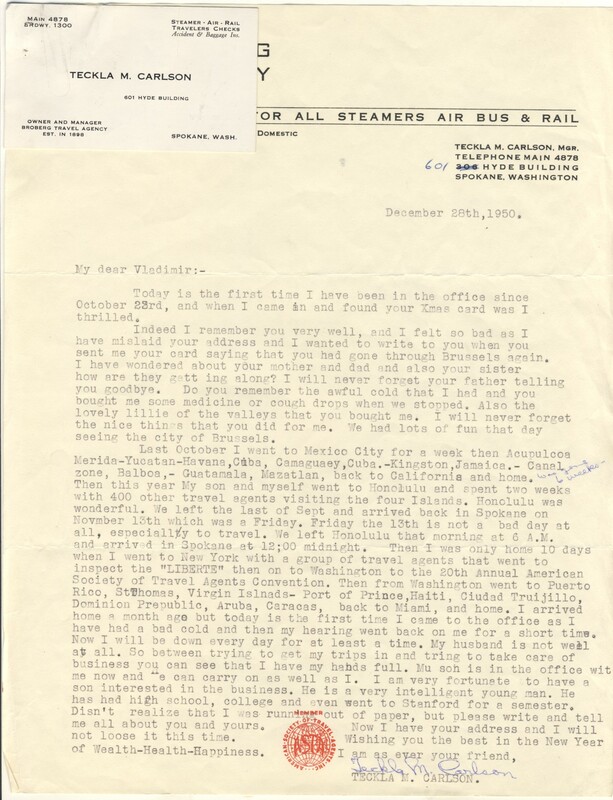 “Sweet Little Darling” is given more than a few hints about his need to be free, but her last letter to him is not until April of ’52; which I will include in the next post. Teckla M. Carlson (who has another letter here)was a travel agent from Spokane, who made friends with Vlado while travelling in Europe, and she appreciated his colorful letters, too. “Boka” was Vlado’s secretary and friend at the UN, and he seems to tell her everything – lucky for her, and us! Just a short note to let you know that I arrived well and that I am thinking of you all the time. I didn’t feel it maybe so strongly when my family was around me all the time, but now that I am on my own I realize how much you have become a part of myself and how it hurts to be separated from you. I am still not sure whether I love you enough to overcome in me the resistance against the taking of such a binding and definite step as a marriage is, and neither am I sure how lasting my feelings for you are and whether they would suffice to give me the power to transform myself into an understanding and forgiving creature for the long years of married life. But if longing for somebody’s presence is a sign of love, then it is a fairly strong one in my case. This longing is getting more constant and persistent now. Before it came mostly at special occasions, when I was seeing something that I would have liked you to see also, when I had some nice food or went to a good show, when the sun was shining and I felt like taking you out for a drive and stretching out at some flowery meadow, or (most often) when I was climbing into my lone bed. But now it is here all the time,- even while I am working I feel a compelling urge to dash out somewhere and meet you for a while, for a few words and for a few kisses. My future is still as hazy and as muddled as it was when I was leaving. All the effort and goodwill that I tried to invest in my boss in Geneva seems to have dissipated into nothing – and not only am I in no position to choose an assignment which would bring me nearer to you (as I was half-ways promised in Geneva), but I will have a hard and uphill fight for maintaining my bare job. Things look quite bad here. Moreover, there are difficulties in my immigration status – they refused to admit me properly without a valid passport,- and unless I can do something about it I will be in a nice mess. Everything seems to be gone wrong since I have returned – even my driving licence is messed up, I had my third speeding ticket just before I left in 1949, I have forgotten all about it, but not the Bureau of Motor Vehicles which promptly suspended my licence and I just don’t know what I will be able to do about it. So you see, I need a bit of good luck or at least something to compensate me for all the adversities,- and now I am without you. I am staying at the Beekman Tower Hotel, 3, Mitchell Place, New York 17, NY. It’s quite nice, high up in the clouds, with a view of the East River and most of New York, and only two blocks from my office. But the room is very small, I have no place to move around myself or my belongings, and it’s much too expensive in the long run. But without the possibility to drive I can’t go anywhere else. So you can still write me there for some time to come. Otherwise there isn’t much about me to report. Write me soon, my Darling, if I cannot see you I long the more for something that would materially establish a nearer contact. Here I was, waiting impatiently for a letter from you (nothing came since the one dated 9/9), and when it finally came, there were only 79 words in it, including date and signature. I was a bit disappointed, but then, I didn’t write any more since 3 September either, didn’t I? So I am trying out now whether the old maxim “if you want to receive long letters often, you must also write some from time to time yourself” will prove true, and I’m switching from the meager postcard diet to a fatter meal of a letter. I was thinking a lot about you, specially the week you were alone in the house, and I was quite seriously thinking of inquiring at the KLM whether they had not some of their stewards sick so that I could get a job on the NY-A’dam run for two or three flights, preferably over the weekend. But then I remembered that stewards have to take care of babies and mothers on the plane, and I am quite sure that I would be no good at that,- and by the time I came around to thinking of some other possibility, the fortnight was over. So we have to postpone it for some other time – or maybe you could get yourself a job as a Stewardess – you would be awfully good at it, and you would have a rather nice house waiting for you at this end to receive you every time you land, with all the trimmings, including a pre-warmed bed if you still like to have it. Quite seriously, don’t you think it would be a nice job – you wouldn’t need to fuss over your shorthand, you could make good use of your language knowledge, helpfulness, and charming self, it would solve your travel-itch, and you might even land a nice husband if you should decide you want one (provided, of course, he wouldn’t mind that I would continue to see you). Sorry I didn’t come around to send you some more of the pictures – I simply don’t find time to do anything. But it’s high up on my must list, to go to town and have some more enlargements made. I didn’t even touch my camera since I came back from Europe, and so you will also have to wait for snaps of the house. I also made a note to get hold of the “I am late, I am late” record. I am quite pleased with life at my new place, and I am getting on quite well with my co-resident, mainly because I never see him. My housekeeper got very Americanized while I was away, she is grumbling if she has to work after dinner, and she made me a cheese-cake the other night with commercial cottage cheese, instead of making the cheese herself. But still, it’s quite pleasant to have every day one’s clothes freshly pressed and laid out, to have one’s food properly prepared, and to be rid of all the unpleasant worries about the small things of one’s home. It’s also nice to be out in the open country, near golf and riding stable, although sometimes I grumble a bit about having to drive every day a hundred kilometers through New York traffic to get to the office. It takes a bit too much time, and with social engagements, professional reading to catch on, and personal business to take care of, it leaves precious little time for myself. Most of it I spent unpacking, checking and rearranging my belongings – I never realized before I had such masses of them – and getting settled. Over weekends I played furiously golf, last week I managed to make 45 holes on one Saturday, wearing out two partners for 18 holes each, and making the last nine a solo. I also found a riding stable near-by, and twice got up at 5.30 for a stroll and canter before leaving for the office. I have to try hard to do something to keep my fat tummy down after the treats it gets every morning and dinner from my cook. I cut out lunches completely, but then I am having chops or a steak every morning on top of my ham-and-eggs, and Slovak desserts at dinner don’t constitute a reducing diet either. Yesterday I went swimming, and then made six miles in a brisk trot along the beach, until I had to admit shamefacedly to my companion, the girl [Boka.-TB] with whom I also usually play golf(by the way we are very old acquaintances, and she knows me much too much to think any good of me – to answer your question), that I couldn’t run any more (she couldn’t either, by the way, but was bluffing to stop me running first). And to-day it’s pouring cats and dogs, so I’m staying at home and will do some reading. Last Monday I had a phone-call from a girl I met five years ago in Cuba. I had forgotten all about her in the meanwhile, and as she identified herself only by her first name, I had to leaf through stacks of old correspondence to find a reference to her second name when I went to call on her. After all, you cannot barge-in into the Waldorf Astoria and search for a Miss Coquitta Idontknowwhatelse. But I found the name finally, although it made me more than an hour late for my appointment. And she was a bit disappointed apparently that I didn’t quite respond to her temperament – well, I’m not quite the same as I used to be five years ago in Cuba, and besides she didn’t please me any more as much as she did then. You know the old story,- I have met somebody in the meanwhile whom I like so much, much more, and although I still am not above meeting another nice girl, and having fun with her, I think I ceased to be quite the “free agent” I used to be before. But it was quite an amusing game, keeping aloof and watching her getting more and more excited and temperamental as I continued to remain amiably and graciously, but correctly, polite. The week before last I was invited to participate in a meeting of the so-called Czechoslovak National Council, where they were discussing their future policy. I got quite disgusted with some of the dear old politicians, they seen to have overslept some twenty years, or else being in a backward development and on their way to fossilization. But it was also quite pleasant to be for two evenings in a dream-like atmosphere, where the restitution of the old order in my home-country was a naturally accepted reality. I refused, however, to be dragged into any of the groups, and intend to remain independent and apart of emigree politics. Well, I guess I made up in the size of my letter for the gap in correspondence. I am now awaiting eagerly a dozen of long, long and longing epistles from you. I think so many times of our little trip from Geneva, Switzerland by train to Basel, by airliner to Brussels and our sight seeing trip together in Brussels. I lost your card with your new address so if you write me again please give it to me again. Have spent one month here already 8 days in Switzerland 10 days in Scand countries and 10 days in Spain now I leave tonight for Paris for one week and then to Jerusalem for 10 days. Then I go home, hope to be there by Nov. 15th if all goes well. Please do write to me in Spokane. I could really slap myself into the face for the way I am behaving towards you. I just don’t deserve it that nice girls like you should care for me – and sometimes I wonder how you still manage to do so. When I am looking at my father and mother – both wonderful people, kind and human,- I can’t understand it where this nasty egotistic streak in me came from. In my better moments I fight against it and here and then I am even able to suppress it for awhile. But then it comes up again and somehow I always achieve to hurt most those people to whom I have most to thank for. I do realize my caddish behaviour, and it make me thoroughly unhappy, but I don’t seem to have enough willpower or stamina to make myself act otherwise – or at least not in time. I do want to do good, and at the end I usually wind up making a thorough mess of everything and spoiling everything. What a curse to have a devil like that warring inside! And I hate the telephone. I was never very good at it, even for strictly business calls, but I never thought it could be so awkward and difficult to speak over it to somebody I love. I just simply couldn’t tell you any of those things I would have liked to – how much I miss you, how I long for your tenderness, for your love, for your companionship, for the fun and giggles we had together, how empty and lonely I feel sometimes, how I would like to talk to you, show you things and take you places, kiss you and hug you, feel your soft, warm and loving presence near me, touch your smooth skin, press you in my arms,- and many other things which I don’t even feel like writing. Instead I spent precious minutes in a silly argument. I loved to hear your voice – you sound terribly British over the phone, much more than when you speak to me directly – but it only made me realize to more your absence. My mind just refused to click properly, and I kept arguing around in circles. Oh darling, everything is so much easier when I can see you and be near you! I don’t think, however that it would have made much sense to meet you here in Geneva. Apart from the complicated and expensive travel for you, the conditions and atmosphere under which I am living here would not have been conducive to a happy being together. My family is definitely jealous of you (or anybody else who “dares” to diminish by a few minutes the time which they can spend with me), I have work to do and duties towards my job to keep in mind, I would have been torn in between all this, and unable to behave humanely. You know how tense and upset I can get about such situations, and how unpleasantly I behave in such cases. We had such a nice time together, and I try frantically (and without success) not to do anything that would spoil the memories of it. Besides, I took an engagement for this weekend to go out with my new boss, and I simply could not cancel it now. I know it’s egotistic and nasty of me to state that to you, who has done everything for me – but that’s how I am, always looking for my own good more than for other people’s feelings. I think it will be much more fun to be together in London – we will be all for ourselves, without anything to bother us except parting. The exposition is supposed to be quite good, we can go to some theaters together, and I already wrote to my friend there to get me some introductions into the poshier nightclubs – we will be finally able to “make the town” together. I phoned for accommodations immediately after I talked with you, they were full at the Cumberland, but I got two communicating rooms at the Grosvenor House. They are sending me also the theater plan so that I can make reservations in advance. Tomorrow I will get you your plane ticket – I will choose a late plane on Thursday night, so that you will arrive at about the same time as I, and you will miss only one day (Friday) in your office. I am leaving London Sunday morning, the latest possible plane which will bring me to New York in time for office on Monday,- and that gives us two full days and three nights,- except for a few hours on Friday when I will have to take care of some of my father’s business, and maybe an hour more to see my friend, whom I cannot completely disregard as he is arranging the nightclub introduction for me. Darling, however much I am looking forward to the chance of being together with you, I would rather miss it than cause you thereby troubles and difficulties. I have no right to demand such things from you, and it would make me very unhappy and spoil our being together if it should be in any way detrimental to the relations with your family or to your good name. We must be reasonable about it. It’s all my fault, stubborn, egotistic bachelor-perseverance, but things being what they are we must face the consequences. So please, darling, think it over well, and don’t hesitate to cable me if you think you cannot make it. It’s getting light outside and I better finish. I still have a contract to go through for my father, and a hard day tomorrow (or rather today) at the office. That’s all I can report about me – work; I did little else since I returned, haven’t been out anywhere except for a small drive with Mom and Sis on Sunday. And I am feeling very blue, unhappy and lonely without you! Be happy, my sweet little darling. I feel lonely without you – nemám sa ku komu íst poradiť a nemám nikoho na kom by mi záležalo a s kym by mi robilo radosť deliť sa o prijemné zážitky. Not that I would be short of girls,- but it’s not quite the same. Tana I see quite often, and she looks quite well and moderately cheerful. She had been afraid she had stomach ulcers, but her doctor said she only had anemia / no wonder she has it, the way she is scared of fresh air and outdoor exercise/,- but personally I think it’s all just nervousness and quite an overdose of introspection. What she seems to need would be some boy-friends in whom she could get interested,- but she doesn’t seem to want it. I escorted her to a party of AirFrance people, and there were quite a few good lookers who showed interest in her, but she just sat in her corner and didn’t seem interested at all. Well, somebody might come one day and sweep her off her feet, I only hope it will be a boy who will appreciate her and who will be worthy of her. I am going again to visit her this afternoon; I am giving a dinner to her boss / Mrs. Eshaya/ and she wants me to meet another Roumanian girl whom I should also invite. But you will probably hear more from herself. My weekend in Boston was very successful – I was invited to a family in one of the very nice residential suburbs, and they had five girls in the house / age 1 to 22/, plus two more whom they asked to come for the occasion. Although it’s only a few miles from the city, they have very nice unbroken forests all around, and I spent most of Saturday cutting a trail through them. I also met a rather fascinating divorcee from the Gardiner family, and to my great surprise she appeared at the last moment at the train and traveled with us coach although she had a Pullman ticket. She asked me to call her up at her New York apartment – but she is not in the phone book and the operator could not locate a phone at the given address. So I don’t really know what to think of it. I would have had no time to do it anyhow, I had socially a very busy time. Rhoda Neilson / my friend’s from Djakarta who are divorcing/ came to New York and we saw each other a lot. I also made friends with an English girl, who seems to be quite taken by me, and very pleasant company, and with a Swedish-born American, who plays double for somebody in Seventeen, who probably doesn’t care a bit for me but who is a master in the art of making one feel that she is enjoying his company. Besides, she is physically exactly the type for which I go. I didn’t play much golf since you left, the weather was not too good. I planned to go yesterday / and it is one of those lovely Indian Summer days/, but then I started raking leaves in the garden, collecting wood for the fire-place, and doing similar chores, and it kept me busy until after dinner. Last Saturday we had the first snow – it melted quickly here, but was beautiful upstate where I went for a drive. Tana Makovická sent the copy of the letter from Schwelb to Dr. K., but she wouldn’t let me have a look at it. She only told me it is not hopeless; but I did not see any vacancy listed any more in the new edition of the bestseller. The P-3 in Trusteeship, territorial research division, is still posted as vacant, also a job in the Narcotics Division / P-3/, about which I had told Dr. K. Friday afternoon. I received a reply from Barbosa about the job in the Reports Division of TAA – informing me that my application was not successful in the Junior Promotion Board. I will try to find out why, and will try to see what else I could get there. From your end I would appreciate to look after the Trusteeship job and see whether I could get anywhere in Human Rights. If not, let me know please and I will ask Dr. K. to see Steinig about the post in Narcotics. Also please check on Olga about jobs in Green’s office and in Economic Affairs in general, and on jobs in the Refugee office. And let me know what the score is, please. How are you doing? – And how is Costi?, give him please my very, very best, I’m really sorry that I cannot see him, but then, he is probably much happier in Paris than he would be here right now anyhow. And how do you like Olga / but honestly/, do you think she ever will be able to stand pat on her own feet and make headway, or do you consider her rather the protection-requiring type? I hope she is not too much nuisance for you. You may meet my mother too, there was an indication in her last letter that she might go to Paris to have a look if everything is OK. I hope they will let you alone, though,- I remember how you “liked” “stará” [translation: “old lady” or “old girl”.-TB] and I surely would hate it to see my family included into the same category. Thanks for your nice little missile from Halifax – it cheered me up a lot. Write to me again soon, please. Great Neck, New York 2.12.51. Thank you for the birthday wishes – really sweet of you not to forget about it! You really make me feel ashamed, I tried to rake my brain but I forget completely when your birthday comes up. Will have to do some sneaking in AW’s files to find out. I am glad you are getting on alright with my sis – I was a little bit nervous how it would work out and scared that my family would encroach upon you / you know I do not want too much competition/. She didn’t write me a line yet / neither did I/,- but antiscribitis runs apparently in the family. Is she still épris by her Dutchman or did she get somebody else for a change in her silly-sweet little head? I hope you impress her with the advisability of looking after sausage kings, specially Latin American ones. And how are your chances looking – or is it still and always The Only One, and no turns allowed while the light is green?/ Is it green, by the way?/ I have quieted down a bit, my divorcee went back to Chicago, and I never found the other one. Also skipped the would-be-actress, it was nice for a change, but it would have probably run into too much money if I would have tried to keep it up. The English girl is still around, we usually drive out together Saturday or Sunday, and have dinner here, and about once a week I have dinner at her apartment in Manhattan when her room-mate is out. My girl-friend from Holland is coming to Paris on the eleventh, I asked her to look up Olga, so you can also look her over a bit and tell me what you think of her. If only she was like you are, or only if you loved me like she does, my household problems would greatly advance towards a satisfactory solution. Still, my private life is not unsatisfactory at the moment, although I am spending more money on food and expenses than I thought I would, and I just don’t find the time to do all the things I want. The approach of Christmas is worrying me a bit, all the cards I will have to send, and the gifts – although I think I will not give gifts to anybody but my family and Helenka, don’t you agree? I am also getting a bit worried about my job since the end of the year approaches and I don’t know whether you can carry me on after that. I saw Barbosa, but he was not hopeful at all. Hausner is also gone. Do you know anything about the Human Rights job, or is that out? And what about Trusteeship? I saw Lande from Narcotics again and took him out to lunch, he told me that the post in his Division is still not filled, but that it is entirely up to Steinig to decide. Could you please let me know how things stand at your end? Balinski is coming back by the end of the year, and I am sure that Krczkiewicz[sp?-TB] will try to push him into the trusteeship job, so if something is to be done, it has to happen before he returns. Did Olga find out anything about jobs in Economics or in the Refugee office? …and the letter cuts off here on a humorous and somewhat intriguing note. She likes to…what? 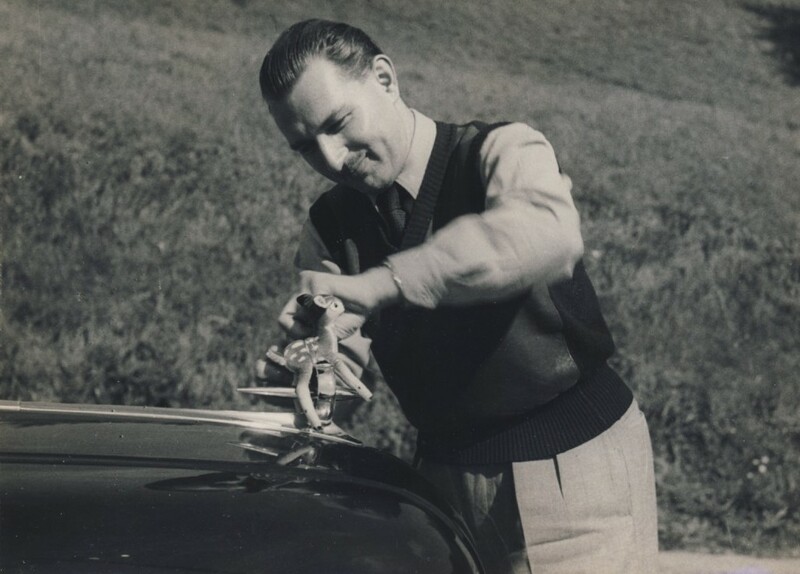 I will be publishing the letters of 1952 next, so I hope you are as amused and enamored by the private life of Vlado as I am, and will return to read more. This entry was posted in Genealogy, United Nations, Vladimir "Vlado" Fabry and tagged Boka, Genealogy, history, Love Letters, Slovak history, Teckla M. Carlson, Vladimir Fabry, Vlado Fabry on March 18, 2014 by fabryhistory. 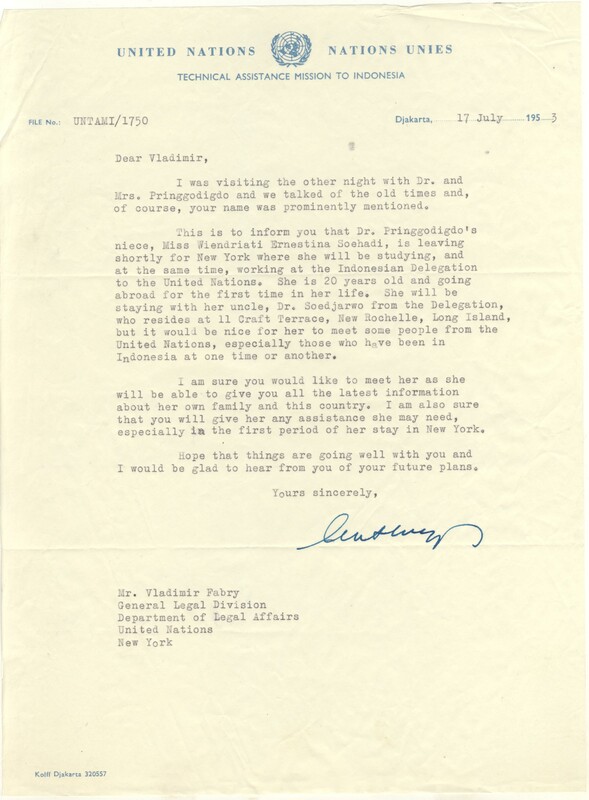 After I posted yesterday, I learned that Lucy T. Briggs was the daughter of Ellis O. Briggs; an Ambassador for 37 years to many countries, including Czechoslovakia; and sister to Everett Briggs. Lucy became the third member of her family to join the career Foreign Service in August 1957, and her brother, Everett, joined the year before. Vlado most likely knew Ellis Briggs, and that’s why Lucy sent him chocolates and the stuffed Bambi before she’d even met him. From the other letters I found from Lucy, the relationship doesn’t appear to be anything but friendly. I suppose when your work takes you all over the world, it’s good to have friends in many places. It was so sweet of you to remember me when you went again to Europe, and to send me a letter from your trip. I hope you had a lovely time, and brought back with you many pleasant memories. I regret only that I did not know of your trip, I would have liked to give you the address of my parents and sister in Geneva and suggest that you use my car while you were in Switzerland,- you can see so much more while travelling independently on the road. Please let me know next time! I left the Indonesian mission in May – I was quite glad to leave the country after having spent three and a half years there. I should not be ungrateful really, it was a very valuable experience, and I had many thrilling moments and adventures, but three and a half years is a long time to spend without friends, accustomed amenities, and access to culture and professional education sources. To make it worse, the tropical climate disagreed with my constitution, I had a number of annoying local diseases, and came back 56 lb lighter than I departed. On the way back, I visited Indochina, Macao, Thailand and Burma, and spent some time in India. I made a trek to the Himalayas from Darjeeling, and luck had it that I arrived at the Tibetan frontier post on the day when the Chinese Communist officers arrived to take it over following the surrender of Tibet to the new Chinese rulers. I had planned to sneak at least for a short look-around into the Land of Monasteries, but the sight of the Red Stars rather damped my enthusiasm, and I limited myself to cross symbolically with one foot – and even that I did rather cowardly at a place screened from the sight of the frontier guards by a big rock. In Europe, accompanied by my family, I toured by car Skandinavia beyond the Polar Circle, the Low Countries, and France and Italy. I arrived in New York late in August, and returned to my regular duties in the UN Legal Department. My home and office addresses are on top of this letter. There is not too much to be written about my life here – after the excitements of my mission assignments and of my travels it is a mere routine. I rented a house in the suburbs, recaptured my cook-housekeeper from the people to whom I had “sublet” her during my absence, renewed my relationships with former acquaintances, and in general live the well ordered life of the Suburban Commuter. When you pass through New York next time, please stop and see for yourself. I am wishing you a Merry Christmas and all the best in the New Year, and hope to see you or at least hear of you soon. Vladimir Fabry, killed in the plane crash that claimed the life of Dag Hammarskjold yesterday in Northern Rhodesia, visited Spokane three years ago. 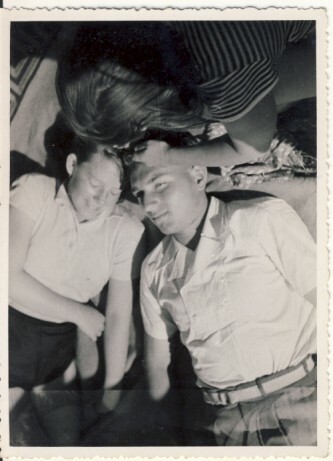 A travel agent, Mrs. Carlson first met Fabry in 1949 at Geneva after he had succeeded in having his father released from a concentration camp. The Spokane woman said they have exchanged letters since that time. This entry was posted in Czechoslovakia, Fabry Family History, United Nations, Vladimir "Vlado" Fabry and tagged Czechoslovakia, Ellis O. Briggs, Everett Ellis Briggs, family history, Genealogy, history, Indonesia, Lucy T. Briggs, Spokane, Switzerland, Teckla M. Carlson, Tibet, United Nations, Vladimir Fabry, Vlado Fabry, Wiendriati Ernestina Seohadi on May 7, 2013 by fabryhistory.